looks very ‘bottish’ to real players. explicit path between the two. clear that navigation meshes are far superior than the other options. own small-time hobby project – enterrecastnavigation. Parse the game datafiles (MPQ’s) and extract the terrain data files. Create a merged view of the terrain data and any objects (buildings, trees etc.). Feed the merged data into Recast which then generates a mesh of the walkable areas. this tile is “RecastDemo” and is included in recastnavigation. Detour can use this navigation mesh data to generate paths. So how do you go about using it? need to write a simple client that uses Detour to do your path finding. easy for my Bot software. When you piece it all together you can get some very impressive results. This video shows a Bot character navigating around some tough obstacles to get to key points necessary to complete Quests. Achieving this with any of the other navigation techniques would have been near impossible. I developed and tested my CapekNav code on a 64-bit Linux PC, however I compiled the DLL on Windows 7 in Visual Studio 2008 and although its been a while it should still all work. The idea behind the small “CapekNav.dll” DLL is that you an hook it up to your existing project pretty much regardless of the language. It’s just a DLL that exports a couple of handy functions. Here I was actually using it from my C# code, but it could have just as easily been used from a C++, Delphi, VB or god-forbid even an AutoIT script. You can download the navmesh tile referenced in CapekNavTest.cpp from here. What revision of recast where you using when building? Is it possible you could post the navmesh file you used in the video? and the source of the recast/detour you used. I cannot get any newer navmesh files I’ve created to work with your method, just your mesh you gave with the file. I can’t find the functions that you call in the detour code. Some of them I could, but not all. It could be that the recastnavigation project has moved on since I wrote this code. It was built and tested against Revision 162 and the latest is 299. It was built and tested against Revision 162 and the latest is 299. Any chance you could post how you generated the nav mesh? Same as tanaris4, that would be awesome. 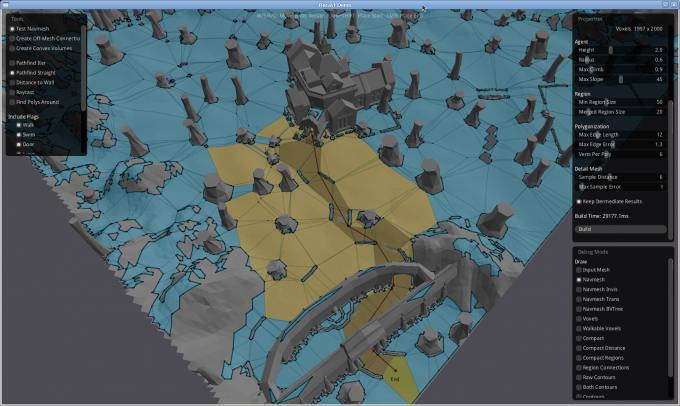 Bump, how you generated navmesh data? Using recastdemo or by recast api, what was your config? This is awesome! Is it possible for you to share the test bot using the dll used in the video?